One of the most common annoyences users have been reporting is the mass of items they have no interest in appearing on their deal feeds. This has been primarily been about clothing which goes through wild price drops. I have been working on a solution for some time, and recently I made it must more friendly. You may have noticed these tags appearing under the results. These are the tags that belong to the product. Clicking them will make the tag be entered into the tags tab at the top of the page. Next to the tag (in this case Category:Clothing) there are three coloured boxes. The green tick box tells the search to look only for product that have this tag. The red box which gets a cross when clicked, tells the search to only show products that do not have this tag. The last, gray, box removes the filtering for that tag and ignores whether it is present or not. 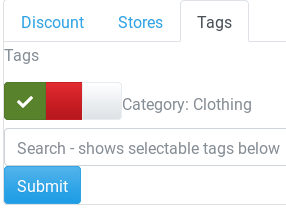 If you are not interested in clothes, click the Clothing tag, click the red box and hit search again. If you are happy with this new search, you can click the home button and it will be remembered as your default. There is a text box you can start typing in to find additional tags. Currently tags are either categories the item is in, or elements of the product name. The name tags allow you to, for example, filter out all products that have the word Xbox in them. The categories are determined from the section of the site the product was found in. It is a long process to correctly label all items, but if you have specific tags that are interest to you, either to find items of or to filter out, then do contact me.